Into the North Atlantic proper, the Volvo Ocean Race boats have been eating up the miles covering around 480 miles in the last 24 hours as they speed north towards Newport, Rhode Island and the finish line of leg six. Rather than sticking to the great circle, the boats have speared off to the west, currently heading towards the Caribbean chain, no doubt partly due to the lure of cheap rum, but more probably down to - in the short term at least - the broad reaching rather than beam reaching sail angles being faster - despite having to cover quite a few more miles by adopting this tactic. Now into the open ocean with, in theory, no land impediments between their present position and the finish, the race course has once again opened up. At the latest sched there is a 49 mile wide span across the race track with Abu Dhabi Ocean Racing having edged her way into the north over the last 24 hours, where she currently resides just ahead of MAPFRE. By virtue of being furthest north, Ian Walker's team has also edged into the lead, which will hopefully mend the disillusion of Whaving been at one point last week been in last place heading up the coast of Brazil. The wind has been as far left as 045°, but is continuing to slowly veer the further northwest the boats sail. On their present course the boats look set to skim Barbuda, or may even edge inside the Caribbean chain as to remain in wind of more than 10 knots they need to be heading just to the north of Puerto Rico in 48 hours time by which time the wind will have veering into the south. Any further east and they risk erring into light winds associated with the westernmost extremity of the Azores high. The tricky bit seems to be over the weekend and on to the finish. Over the weekend there appears to be no wind on the right side of the course, in the wake of a depression that is heading off to the northeast ,but there is a band of light northeasterlies closer to the coast. However all roads to Newport look set to be blocked temporarily as on Sunday an area of high pressure moves off the US Eastern seaboard to fill the void left by the depression and over the course of Monday and Tuesday looks set to merge with the main area of high pressure. In fact the latest forecast shows that by Tuesday night this has developed its own circulation and the boats are likely to attempt to key into the favourable SSEerly wind on the southwest side of the high to get them north to the finish. Or at least that is how it looks at the moment (based on the GFS model). This is what it’s like to sail 31 knots in front of a squall in the middle of the Atlantic Ocean: It’s time for sunset but from my desk down below it sounds like we’ve suddenly taken a turn down on a class 4 rapid. We’re going faster than usual. The nav desk speed-o peaks out 28 knots but the noises are getting louder. It takes a cautious minute to navigate the 3 meters from the media desk to the companionway. The boat is jumping like an angry bull from the tops of 10’ waves and the noises are halfway between terrifying and incredible. I look outside and an ocean is running over the deck and leaping off the coach roof and drenching all the sailors in the cockpit. Charles still isn’t wearing pants. Or shorts. But that hasn’t changed since we left Brazil. A massive white squall is stalking us in the background and we’re going to ride it out for the next hour. It’s Christmas in April. 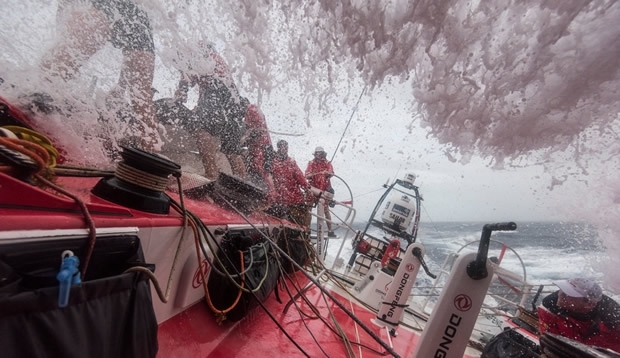 31 knots might not feel fast in a car, but onboard a Volvo Ocean 65 it’s a very different sensation. “I imagine it’s like driving a car at 250 kilometers, offroad,” says Charles. “But it’s not 300km, that’s 40 knots,” he adds. Charles and Pascal are used to racing maxi trimarans that are just a little bit faster, but for the rest of us, 31 knots is still a rush. At 31 knots your eyes start burning from the salt spray. It’s why the sailors usually wear helmets with visors. The waves launch over the boat and across the deck with such force that they can knock you off your feet. Or push you along the deck if you’re sitting. The best lesson I ever learned -by trial and error- is to never hold the camera directly in front of your face when filming in 30 knots or more. It’s not fun to get pistol whipped by your Nikon. The ride pushes us about two miles ahead of the fleet, a small gain that they’ll likely take back in the next 24 hours. That’s how it goes. After sunset I cook a pot full of spaghetti and ask Charles for a navigation update. He’s still not wearing any pants. “The European and US weather models are disagreeing,” he explains. And the routing options on his screen appear endless. The U.S. model is calling for east and Europe is saying west through the islands, which is much longer in terms of miles. “I have no idea,” admits Charles.